Freeze branding is a relatively painless and very effective form of permanent identification. Freeze branding works by destroying the pigment producing cells in hair follicles, resulting in white hair growth. The cows are restrained in a crush or similar, then the area where they are to be branded is clipped and cleaned. The irons that have been cooled in a mixture of dry ice and alcohol are then applied to the cow for the required time. 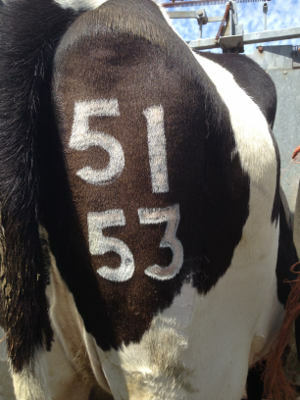 After branding there will be a slight swelling for 4 to 5 days. A scab will form over the branding which will drop off after 3 to 4 weeks and after this the white hairs will start to grow through. It will then take a further 3 to 4 weeks before the brands become fully formed.